We use an SLW20 to control the watering schedule of the sprinklers in our yard. In about 8 years, we have had the SLW20 fail twice, once after 5 years, the next after 3 years. Since these are not cheap (about $200/piece), I decided to investigate after the second failure. Turns out that in addition to the field-replacable 9V battery, there is a non-replacable 3V CR2032 coin cell built into the station. When this coin cell drains, the station dies. 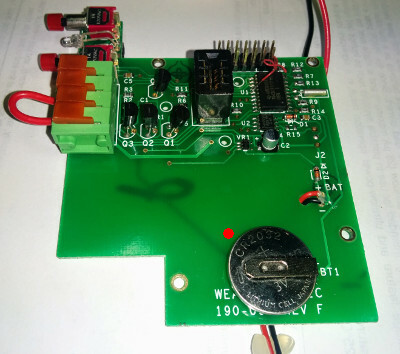 Fortunately, it's not hard to convert the SLW20 to make the coin cell replacable. Remove the three screws from the base of the SLW20. The screws are marked with a red dot in the picture below. Now pop the bottom off the SLW20. You should see a PCB that looks similar to one in the photo below. Pay attention to the routing of all the wires, in particular the clear wires in the top left. You'll have to use the same arrangement to close up the unit later on. 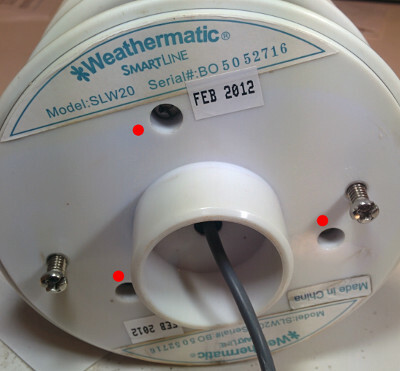 Remove the four Phillips screws marked with red dots in the photo below. 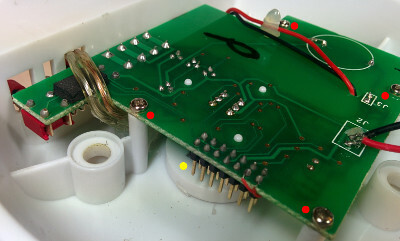 Once these screws are removed, angle up the PCB while, from the other side, pulling down the plastic rod housing the temperature sensor (yellow dot). 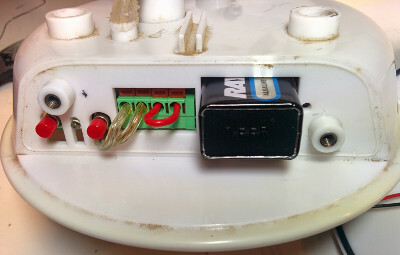 That should let the temperature-sensor rod unplug from the PCB and let you gently remove the PCB. 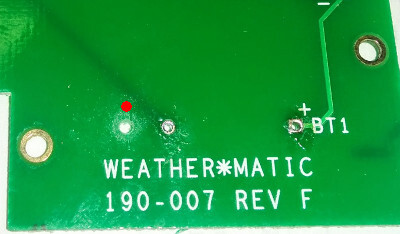 The old CR2032 coin cell can now be found on the top side of the PCB, marked by red dot in the photo below. Desolder this battery and recycle it. To be able to replace the battery in the future without soldering using a standard CR2032 cell, I installed a 20mm coin-cell holder. I used a Keystone Electronics 1066 (Digi-Key 1066K-nD, $1.58/pc). 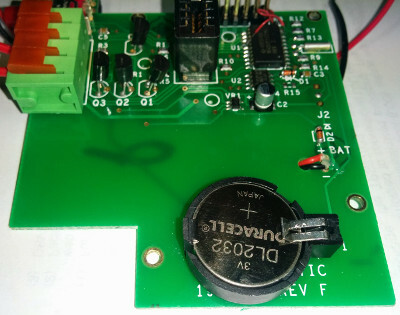 The cell-holders pins are further apart than the pins on the original battery so I had to drill a hole in the PCB for the second pin, shown by the red dot in the photo below. With that hole in place, I could then solder in the holder and wire up the negative pin to the old trace with a short piece of wire. 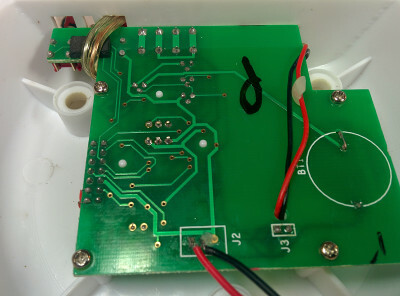 This is what the PCB looks like in the end, with the new CR2032 cell installed. 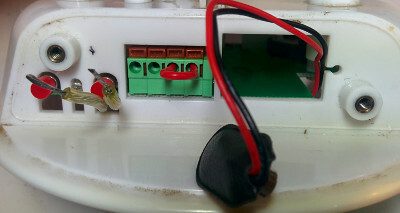 You can confirm that the board is working by attaching the 9V battery and then briefly pushing the left push-button. The LED should blink green and red. Now all that's left to do is to reassemble the unit in reverse order and you're done. Happy (controlled) watering!